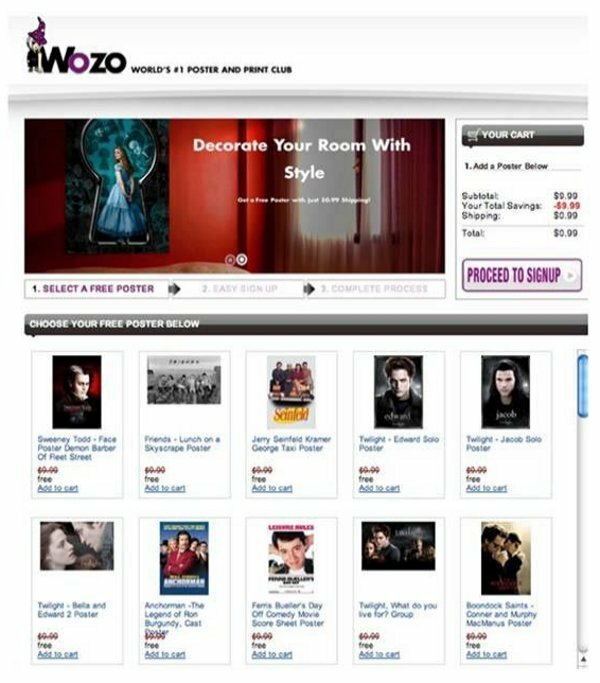 A class action suit filed in Boston accuses Wozo, LLC, Tatto, Inc., and Adknowledge, Inc., of promising consumers a free poster and then enrolling them in a monthly club at a cost of $29.99 per month. The suit charges that the companies are “selling a completely different product than the one displayed on the web pages” promising the “free” poster and says there is no mention of the monthly fee anywhere on the web pages. Instead, consumers who expect to pay a one-time shipping fee of 99 cents find themselves enrolled in a “useless 'poster club,'” the suit alleges. “Few consumers, if any, would ever elect to buy a $29.99 monthly membership to receive only two posters per month, particularly when those posters are arbitrarily selected by someone else,” said the named plaintiff, Suk Jae Chang, of Arcadia, Calif. The suit, filed in U.S. District Court in Boston, says the companies' practices violate Massachusetts laws that prohibit using misleading and deceptive advertise and failing to adequately disclose the true terms of an offer. The suit also charges that the web sites contain a pre-checked box indicating that the customer agrees to all terms and conditions but does not contain a hyperlink to any such terms and conditions. Congress recently passed a measure called Restore Online Shoppers Confidence which specifically prohibits opt-out membership programs, the suit notes. The case was filed by Boston attorneys Todd Heyman and Robert Ditzion.